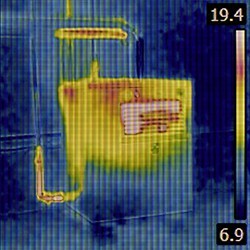 Thermal Imaging has evolved into one of the most valuable diagnostic tools to be used for predictive maintenance, whether it be detecting a hot spot on an electrical installation or perhaps surveying a building for a heat loss. Unintrusive, this technique is used to detect anomalies often invisible to the naked eye. Most electrical equipment generates heat during normal operations. Usually, this heat is safely dissipated on its own. But corrosion, loose connections, misalignment or overload conditions can cause components to generate excessive heat, resulting in potentially serious problems. A Thermographic survey is a reliable and non-intrusive method of visualising the temperature distribution on object surfaces. This has revolutionised the predictive maintenance programs of industries worldwide. Utilities, industrial, manufacturers and many other organisations have realised the significant savings that early detection of hot spots in their high voltage system can provide. The proven ability to find heating anomalies before they evolve to a costly failure, has amounted to huge savings across all sectors of the high voltage industry. Our staff are electrically qualified and power system authorised to be able to access switchboards and switchyards, observing correct limits of approach, to perform inspections without compromising safety. If appropriate, we are able to rectify low voltage faults on the spot saving costly revisits. We are also able to rectify high voltage faults during an outage. Enersols IR inspections are performed while your system is energised and operating, avoiding production downtime. And unlike many other predictive maintenance tests, infrared inspection does not require physical contact with the equipment. When included as part of a planned maintenance program from Enersol, it allows you to identify and deal with emerging problems early enough for maintenance to be performed, reducing emergency repair and maintenance costs, improving overall system reliability and extending the life of your equipment.